I have noted before that Franz Hilgendorf (1839-1904), a German palaeontologist, was apparently the first person to publish a Darwinian tree based on the fossil record, in 1866 (Who published the first phylogenetic tree?). Indeed, among the people who first produced trees inspired by Darwin's work, Hilgendorf seems to have been the only "real" Darwinian — St George Mivart later became a strong anti-Darwinist, Albert Gaudry accepted Darwin's genealogical ideas but rejected the idea of natural selection, and Ernst Haeckel was in practice more of a Lamarckian than a Darwinian. Hilgendorf, on the other hand, continued to pursue Darwinism throughout the rest of his career, even being the first to introduce evolutionary theory into Japan (c. 1873) . What I wish to point out here is that he was also the first person to face what I will now christen "Hilgendorf's Dilemma", which is a problem that phylogenetics has faced ever since the publication of Darwin's book in 1859. Hilgendorf solved the problem in the same way that later phylogeneticists also did — it is only in the last 2-3 decades that a different solution has been widely adopted. The problem is this: what do you do when your data are not tree-like but you accept the evolution-as-tree paradigm? The solution of choice has been: publish a tree anyway. I have previously emphasized the important point that the earliest genealogical diagrams were networks, published in 1755 and 1766 by the Frenchmen Buffon and Duchesne, respectively (Networks of genealogy). However, genealogical diagrams were then mostly ignored for the next century, except by Lamarck — most published relationship diagrams were affinity networks rather than representing genealogy (see Affinity networks updated). One of Darwin's main goals in 1859 was thus to re-introduce genealogy as being the most important relationship concept in biology. However, he chose the tree as his metaphor rather than the previously proposed network. This seems to have been a rhetorical device as much as anything else, alluding to the biblical Tree of Life (Hellström 2011, Penny 2011). Darwin succeeded in his goal, and genealogical trees have been the dominant metaphor since that time, rather than genealogical networks. Hilgendorf knew and apparently accepted Darwin's ideas (Heinrich Bronn's German translation of the Origin had appeared in 1860), and he applied them to his PhD studies in 1862. He was investigating the fossil gastropods of the middle Miocene basin at Steinheim, in southern Germany. He studied the morphological variation, in the different stratigraphic layers, of the various fossil forms of what he referred to as Planorbis multiformis. Importantly, he recognized that the different morphological forms (which he called varieties) occurred exclusively in different stratigraphic layers. Thus, what he saw in the stratigraphy could be translated into a phylogenetic diagram, as shown in this next figure. 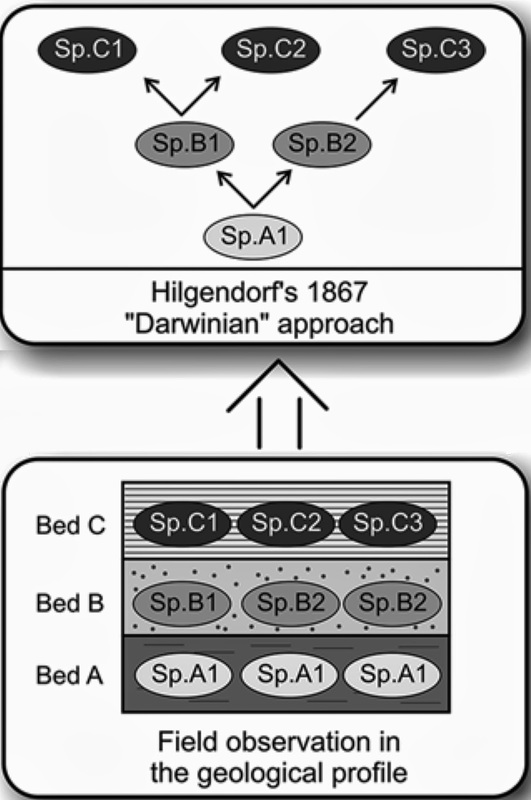 On the face of it, Hilgendorf's work provides strong support for Darwinism, and in his thesis (Hilgendorf 1863) he explicitly noted the relationship to Darwin's ideas. However, he did not include his phylogenetic diagram, and he did not publish his thesis. The 42-page thesis was hand-written, and he did not even leave a copy behind at the University of Tübingen. The only known copy (presumably the original) is now in the Museum für Naturkunde, Berlin, where Hilgendorf later worked, donated by Hilgendorf's heirs. It was discussed by Reif (1983), and has recently been transcribed by Glaubrecht (2012). The usual explanation given for Hilgendorf's decision not to publish is the controversial nature of the subject of evolution (eg. Weltner 1906, Reif 1983, Janz 1999, Glaubrecht 2012), which was not even supported by his own supervisor (Friedrich von Quenstedt). However, it seems equally likely that the explanation was Hilgendorf's Dilemma. Eine Beobachtung die, so viel ich weiß, mit den bisher aufgestellten Ansichten nicht stimmt, [wäre], daß früher getrennte Arten sich einander nähern und endlich miteinander Verschmelzen können. Darauf würde das schöne Bild, das Darwin uns vom Zusammenhange der Species in einem Zweige=reichen Baume vorführt, nicht passen; die Zweige eines Baumes wachsen nicht wieder zusammen. An observation which, as far as I know, contradicts these previously discussed views, [would be], that formerly separate species approach each other and finally merge with each other. This would not fit the beautiful image that Darwin presented about the connection of species in a branch-rich tree; the branches of a tree do not fuse again. The problem for Hilgendorf was that this is precisely what happened in his reconstructed phylogeny. Among the Hilgendorf artifacts found in the Institut und Museum für Geologie und Paläontologie, Tübingen, as discussed by Reif (1983), is a series of cards attributed to the time of his thesis work. These mostly illustrate some of Hilgendorf's proposed morphological transformation series, but one of them represents a phylogeny. This is shown in the next figure. This phylogeny shows gradual transformation of lineages (anagenesis), splitting of lineages (cladogenesis), and one lineage fusion. The diagram seems to accurately reflect the discussion in Hilgendorf's thesis, and so it is considered to be the phylogeny "missing" from that thesis. What he did, instead, was return to Steinheim two years later (1865) and collect more data. This time his phylogenetic method produced a tree instead of a network (illustrated in Gastropods on Monday), and he subsequently published the result (Hilgendorf 1866, 1867). This paper makes no mention of Darwin at all. Interestingly, the first version had a subtitle ("an example of morphological change through time") that was not used in the final version, thus expunging all explicit references to evolutionary theory. It was not until Hilgendorf (1879) that he once again placed the Steinheim work into an explicitly Darwinian framework. Hilgendorf continued to defend his work in print against attacks from a number of people, notably Carl Sandberger, another German (who rejected transmutation entirely), and Alpheus Hyatt, an American (who was a Lamarckian) (see Reif 1983, Janz 1999, Rasser 2013). Ironically, these two anti-Darwinians seem to have convinced Darwin himself that Hilgendorf's work was not worthwhile (see Rasser 2013), and the only comment that Darwin added to later editions of his book was: "Hilgendorf has described a most curious case of ten graduated forms of Planorbis multiformis in the successive beds of a fresh-water formation in Switzerland [sic!]." As a result, Hilgendorf and his work have been ignored by most biologists. Note that Darwin consistently down-played the importance of fossil evidence for his theory — he seemed to think that biogeographic evidence, for example, would be more convincing (as independently suggested by Alfred Russel Wallace). He thus failed to give due credence to the work of both Hilgendorf and Gaudry (a Frenchman digging in Greece), who each provided the first good examples of Darwinian evolution based on fossil stratigraphy. I see Hilgendorf's personal history as the first example of a dilemma that all subsequent phylogeneticists have potentially faced, and when necessary have usually resolved in a similar manner. Darwin inappropriately changed the phylogenetic metaphor from a network to a tree, even in the face of then-known reticulation processes such as hybridization and introgression. And every time we are confronted with non-tree-like data we face the same dilemma; and most people have resolved it in the same way by publishing a tree instead of a network (see Phylogenetic networks 1900-1990). It is only in the past couple of decades that we have started to behave in a more rational manner, and have returned to publishing networks instead of trees. Darwin C. (1859) On the Origin of Species by Means of Natural Selection. John Murray, London. Glaubrecht M. (2012) Franz Hilgendorf's dissertation "Beiträge zur Kenntnis des Süßwasserkalks von Steinheim" from 1863: transcription and description of the first Darwinian interpretation of transmutation. Zoosystematics & Evolution 88: 231-259. Hellström N.P. (2011) The tree as evolutionary icon: TREE in the Natural History Museum, London. Archives of Natural History 38: 1-17. Hilgendorf F. (1863) Beiträge zur Kenntniß des Süßwasserkalkes von Steinheim. Unpublished PhD Dissertation. Philosophische Fakultät, Universität Tübingen, 42 pp. Hilgendorf F. (1866) Planorbis multiformis im Steinheimer Süßwasserkalk: ein beispiel von gestaltveränderung im laufe der zeit. Buchhandlung von W. Weber, Berlin, 36 pp. Hilgendorf F. (1867) Über Planorbis multiformis im Steinheimer Süsswasserkalk. Monatsberichte der Königliche Preussischen Akademie der Wissenschaften zu Berlin 1866: 474-504. Hilgendorf F. (1879) Zur Streitfrage des Planorbis multiformis. Kosmos 5: 10-22, 90-99. 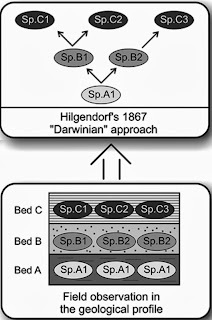 Janz H. (1999) Hilgendorf's planorbid tree — the first introduction of Darwin's theory of transmutation into palaeontology. Paleontological Research 3/4: 287-293. Penny D. (2011) Darwin's theory of descent with modification, versus the biblical Tree of Life. PLoS Biology 9: e1001096. Rasser M.W. (2013) Darwin's dilemma: the Steinheim snails' point of view. Zoosystematics & Evolution 89: 13-20. Reif W.-E. (1983) Hilgendorf's (1863) dissertation on the Steinheim planorbids (Gastropoda; Miocene): the development of a phylogenetic research program for paleontology. Paläontologische Zeitschrift 57: 7-20. Weltner W. (1906) Franz Hilgendorf. 5 Dezember 1839 – 5 Juli 1904. Archiv für Naturgeschichte 72(1): I-XII. "Die ältesten teilungen des indogermanischen bis zum entstehen der grundsprachen der den sprachstamm bildenden sprachfamilien laßen sich durch folgendes schema anschaulich machen. Die länge der linien deutet die zeitdauer an, die entfernung derselben von einander den verwantschaftsgrad." ["The oldest splits of Indo-European until the development of the language families which built the basic branches of the family can be illustrated with help of the following schema. The length of the lines indicates the time span, their distance the degree of relationship."] (Schleicher 1861, "Kurzer Abriss einer Lautlehre der indogermanischen Ursprache": 6f). It is not entirely clear what Schleicher here means with "degree of relationship", but given the original tree image (see, for example, here: http://functionalshift.files.wordpress.com/2011/10/schleicher_tree-1861-ger.jpg), and what we know about the languages, it seems clear that he deliberately chose to put the contemporary languages which show close similarities (compare, for example, "deutsch" [German], "litauisch" [Lithuanian], and "slavisch" [Slavic]) closer to each other, although the splits (which are meant in temporal terms) are reconstructed much earlier. So somehow, Schleicher is also facing a problem of making a distinction between the different degrees of similarities that languages may exhibit. He sticks to the tree image, but at the same time he tries to use it for more than that. Note, however, that Schleicher is surely not pointing to lateral connections here, since according to his methodology he should have ruled those out, but there was always a certain feeling in linguistics that geographical closeness between languages may also have an impact on their development, leading to some kind of convergence in their evolution. Maybe, Schleicher had this in mind. Another language tree that seems to confound both historical relationships and geographical closeness is the c.1800 Arbre Généalogique of Félix Gallet (see the blog post An early tree of languages). Sylvain Auroux, in his discussion of this tree, notes that it is an intermediary between modern genealogical ideas about language history and the preceding interest in geographical comparisons of languages. Perhaps Schleicher was making the same transition, from geography to history. Interestingly, Buffon's original 1755 phylogeny of dog breeds (see the blog post The first phylogenetic network) also displays both history and geography, because the dog breeds are arranged geographically but are connected by lines representing history. It seems to have taken time for people to treat history as the primary feature of relationships (ie. genealogical relationships).